and the Surrounding Areas since 1955. The Largest Locally-Owned Independent Uniform Service in South Texas. Being Local and Family Owned in the service business means all the difference in the world! Established in 1955, Brite Star Uniforms provides uniforms, mats, and linen service throughout South Texas. Operated by second and third generation owners, Brite Star’s focus is on top quality uniform service, accurate delivery, dependable repairs, and fair billing . Brite Star provides a level of service our chain-company competitors simply have been unable to match. When you are ready to enjoy the advantages of trading with a local family-owned business, we have a process to make the switch easy. Over the past few years, we have invested heavily in time and money to develop a system to perfect the level of service we provide our customers. A key component of our system is Brite Star’s exclusive Star Track Guaranteed Delivery System. 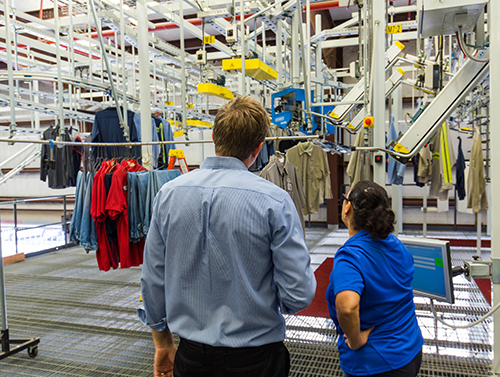 We are very proud of the fact we were the second company in the world to use UHF-RFID garment tracking chips in a fully automated uniform sorting system, second only to Disney World in Florida.